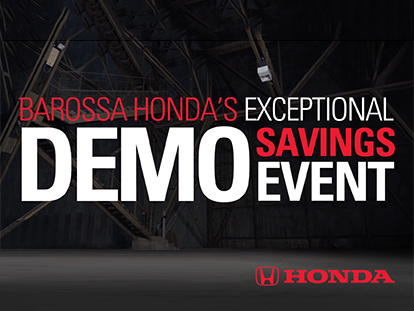 Get exceptional savings on a large range of Premium Honda Demonstrators at Barossa Honda’s Exceptional Demo Savings Event. If you’re looking for a New Honda without the new car price tag, Barossa Honda’s selection of demo Honda vehicles are the perfect solution for you. All of our Honda demonstrator vehicles have been well cared for and are low in both kilometres and price, making them the perfect choice for anyone hunting for perfect value for money. So, what are you waiting for? Browse our range of Honda demos online and score a great deal today. For more information about our ex-demo Honda vehicles for sale at our Tanunda dealership, or to book a test drive, please don’t hesitate to Contact a member of our friendly team today. I’ve joined the Barossa Auto Group this year, and I’ve always had a love of cars, ever since riding in Dad’s 1926 Pontiac Chief-of-the-Sixes as a young lad. Honda is a very exciting brand, and Honda’s new cars are at the cutting edge of technology. I want my customers to have the best experience, and to make sure that they purchase a safe and reliable vehicle that meets their needs. I’m enjoying fatherhood, and my 3 year old seems to have inherited my love of cars too! My hobby is Vintage computers, which I enjoy fixing and restoring.